From time-to-time every business needs to raise extra finance. This can be for a wide variety of reasons. Perhaps you want to buy new plant and machinery, or investigate moving into a new market. There is a wide range of financial resources you could possibly draw on to secure the money you need. Take your time to weigh up all the pros and cons of each before making your decision. Take some expert advice as financial professionals could offer you alternative sources of finance you hadn't considered. These types of loans can be used for any purpose, but generally speaking, a business loan is for larger amounts of money to fund the purchase of plant or machinery. You will be offered either a fixed rate or variable rate of interest. Bank loans are ideal if you want to borrow money over a longer period of time and can help your business's budget and cashflow. If your bank turns you down, this scheme could provide the money you need if your bank participates in the scheme. The government guarantees 75% of the loan. You can borrow from £5,000 to £250,000 over 10 years. But your business must be under 5 years old and be turning over less that £5.6 million a year to qualify for the loan. More information is on the Department for Business Enterprise & Regulatory Reform (BERR) website: www.berr.gov.uk. Often overlooked as a means of raising finance, if the amount of money you need is quite small, you could ask your bank for an overdraft facility. You in effect borrow from the bank at an agreed interest level. The beauty of an overdraft is that you only pay interest on the outstanding amount, whereas with a business loan you have to borrow the whole amount on which you pay interest. Remember, though, that the bank can demand the all of the money you are overdrawn back at any time. One of the most overlooked sources of finance is grant aid. Your business could qualify for a grant in certain circumstances. 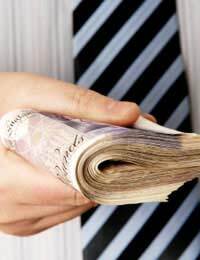 It's estimated that UK businesses miss out on over £125 million of grant aid each year. If you need money to develop a new technology, then pay a visit to the BERR website [www.berr.gov.uk/innovation] as grants are available in this area. EUREKA is a pan-European source of grants for research and development of new projects. If you need to retrain your staff details of grants you could claim are available on the Learning Skills Council [www.lsc.gov.uk] website. Grants and Support Directory online at: [http://tinyurl.com/fjpeg] is operated by Business Link and enables you to search for over two thousand grants currently available. If you have a well-established business and are in need of significant financial help, venture capital could be a good source of support. The businesses and individuals that offer venture capital are looking for well-run established businesses they can invest in. New technology and moving into new markets are good examples of areas that venture capitalist would be interested in making an investment. You can get more information about venture capital on their British Venture Capital Association website: www.bvca.co.uk. Unlike venture capital companies that are usually groups of investors backed by large equity companies, business angles are usually wealthy individuals who will offer you the money you need for a percentage (equity) in your business. The advantage of using business angles is that you can often make a more personal connection to them than with venture capital firms. The business angel can also offer their considerable business knowledge to your business. More information is on The British Business Angels Association (BBAA) website.